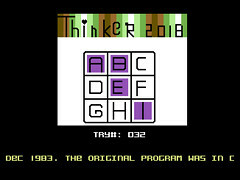 Thinker 2018 is a new game for the Commodore C64. The game is a puzzle game and is made by Matteo Angelini. The music for the game is from Richard Bayliss.